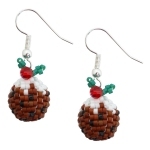 What Christmas outfit wouldn't be complete with these adorable little cheery mini Christmas Pudding earrings! These would make adorable little presents this Christmas! Using just a few beads and findings, these little earrings are so quick to make up, taking only about 1 hour to create. As usual with ThreadABead featured patterns we give full detailed photographic instructions and in this pattern there are 21 detailed steps, making this pattern even suitable for beginners to beading. This ornament bead pattern is made using Japanese Miyuki size 11 Delica. A form of Round Peyote stitch is used but full detailed instructions are given and no previous knowledge of the stitch is required. Please note the pattern may not work with any other size and type of beads. There are 4 delica colours in total and the finished beadwork is approximately 1.5cm x 1.25cm. 2 x 10mm Crystal AB, 2 x 4mm Swarovski Siam AB beads along with 2 x silver plated wire guardians pins and 2 silver plated ear wire earring fittings are also required. The bead pattern supplied is 10 pages and includes 21 full colour photo instructions.